Structure My Deal tools are complete — you're ready to visit Brown's Chrysler Dodge Jeep Ram! When you're considering your options for a mid-sized sedan to drive around Westlock, don't look any further than the 2019 Dodge Charger. Filled with technology to make driving easier and safer, it's ready to keep you connected wherever you're going. Brown's Chrysler Dodge Jeep Ram can show you the features that make this vehicle unique. 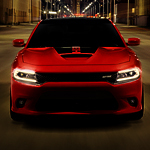 To make driving with cruise control safer, the Dodge Charger comes with Adaptive Cruise Control with Stop technology. This system will monitor the distance between you and the car in front of you and automatically keep it the same. For convenience, the Dodge Charger comes with a Keyless Enter 'N Go key fob. The doors will automatically unlock as you approach the car and pull the front handle. It will also allow you to start the car with the press of a button as long as you have the key with you.